← RP: Way to go, Makes No Sense Man! That’s pretty much how Napoleon got his start! 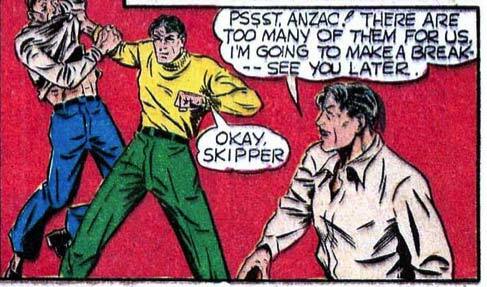 I love how Anzac (is that his name, by the way, or is the skipper just using the general term because he doesn’t know or care who the guy is?) is totally okay with Skipper running away and leaving him alone to face the numbers that were too much for both of them. It’s like…why, it’s like it happens all the time! I love the subtext to this panel. I love the subtext too, in the same way as X-stacy. The “pssst” also cracks me up. Bodies flying around, guns firing, the sound of flesh smashing into flesh, and this guy’s whispering his bold plan of running away. I bet he has the most loyal crew on the high seas.